Local naturalists had noted fairly significant movements of raptors along this stretch of the Lake Eire shoreline as far back as the late 19th century but a more organized hawk watch didn't occur till the mid to late 20th century. 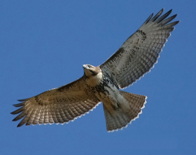 In 1974 the Hawk Migration Association of North America (HMANA) was formed with the goal of providing standardized forms and protocols for recording raptor migration counts. The Hawk Cliff Hawk Watch is manned by a number of volunteers dedicated to the conservation of migratory raptors, passerines and Monarch butterflies of North America through scientific study, public education and appreciation of their fall migrations. 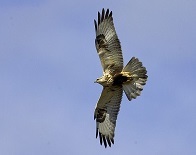 Over the years the Hawk Cliff site has grown in popularity and today it is recognized as one of the prime fall migration hawk watching destinations in North America. Birders can normally expect to see some 15 different raptor species including the always sought after Peregrine Falcons, Broad-winged Hawks and the amazing Golden Eagles. Typical daily count totals can reach 100's to 1000's of birds but on a few exceptional occasions lucky visitors have witnessed the amazing spectacle of over 100,000 raptors of various species migrating past Hawk Cliff in a single day! 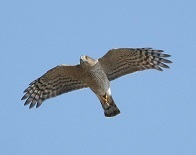 The primary migration occurs at Hawk Cliff during the fall season from September to November. 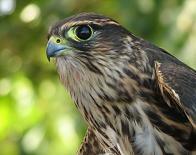 However, raptors begin to migrate mid-August and will continue to migrate through to the end of December. The peak volume of raptors occurs in September with typical large Broadwing flights while peak variety of species occurs in October when we can get all 15 of the usual raptor species in a single day. The Kestrels are fond of hovering over the open fields in front of the hawkwatch area as well as along the cliff edge, watching intently for a quick snack. 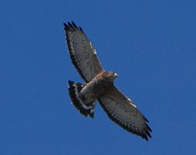 At Hawk Cliff we often see them passing through in groups comprising 10, 20 even 40 birds all at the same time! The Merlin is a tough bird to peg to a specific flight line through the hawkwatch area...they simply seem to go almost anywhere and everywhere they like. They are VERY speedy flyers in level flight...and usually cross through the hawkwatch area so fast that visitors who blink will miss them! 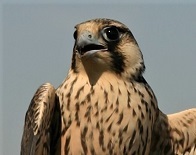 Peregrines can be seen migrating right along the cliff riding updrafts created by strong SW winds and even on other wind directions they almost always pass by within a couple of hundred meters of the Cliff itself. They rarely need flap at all as they cruise past in mere seconds! The Northern Harrier is one raptor species that typically provides the closest looks and great photo ops during migration as they fly a mere metre or two off the ground hunting the field in front of the count area. 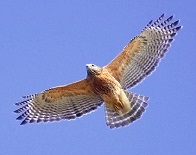 Note that the Harriers are sometimes seen soaring high above as well. The best views of Sharp-shinned Hawks are usually right at "Sharpie Alley" (just south of the ravine) where one might have a Sharpie nearly take off your hat! 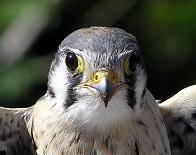 The Sharp-Shinned Hawks can be seen chasing other small birds, looking for a quick meal. Like most accipiters, Cooper's Hawks tend to pass the watch along the tree lines or by sneaking along the cliff though they can also be seen soaring high with the buteos looking like a flying cross. The best views of Cooper's Hawks are also often at "Sharpie Alley". 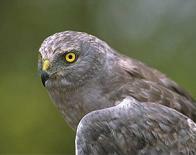 Northern Goshawks are often seen very low crossing the hawk watch area at tree top height or lower. 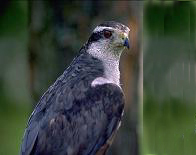 Their bold white eyebrow can be seen often at a pretty good distance and they are a large heavy looking bird. When they do soar look for their wedge shaped tail. 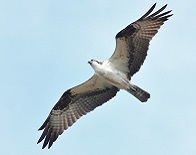 Ospreys are typically cruising along above the cliff edge, using the updrafts of south and southwest winds hitting the cliff face. They may also be observed soaring with other raptors in kettles in thermals. They're very distinctive in flight, holding their wings in what looks like a "W" shape. The best views of Bald Eagles tend to be as they cruise low along the cliff edge. Experienced observers will also look for the occasional eagle using the same flight lines as the Turkey Vultures. 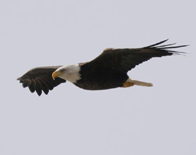 Bald Eagles have a very distinctive head-on flight profile...flat from wingtip to wingtip. 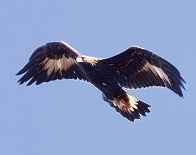 The Golden Eagles are most often spotted crossing through slightly inland from the cliff. Experienced observers know to watch for Golden Eagles mixed in with flights of Turkey Vultures. 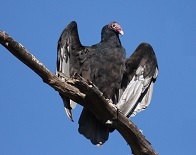 Their appearance can be very similar to the vultures, big and dark and exhibiting a slight dihedral in their wings. Red-shouldered Hawks are often seen soaring and kettling with Redtails and as they fly towards you their wings are more bowed. Note, however that Red-shoulders usually prefer to migrate on less windy days. They seem not to like fighting into a strong head wind as much as the Redtails. 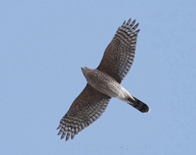 Broadwings can be seen virtually anywhere along the roadway just inland of the cliff to several km's north back towards St. Thomas. The key to seeing Broadwings and possibly large kettles is finding their flight line and getting yourself underneath it. Kettles of several hundred birds are possible. Redtails migrate through the hawkwatch area in almost any location from the cliff itself, inland to "Sharpie Alley" and further north to the Fruit Ridge Rd. They are the most prominent species in kettles occurring in the latter part of migration. They will power their way into strong head winds. Roughlegs pass through the hawkwatch area inland from the cliff. Observers will most often watch for Roughlegs starting at "Sharpie Alley" (just south of the ravine) and then moving further northward. They're typically seen migrating through individually in small numbers. They're very large dark birds and easy to spot spiralling upward, gaining lift and then power gliding off westward to the next thermal. Experienced observers will look for the flight lines being used by the Turkey Vultures to spot smaller raptors that are moving with them.